One who is endowed with strength, vigorand brilliance.om ojas-tejo-dyuti-dharAya namah. Ojas means strength or inherent vitality, tejas means reputationor power to overcome enemies, and dyuti means effulgence or radiance.Since bhagavAn alone has all of these, He is ojas-tejo-dyuti- dharah.Recall that we are now going through the nAma-s that describe theviSva-rupa. SrI Sankara gives the reference to gItA - tejas-tejasvinAmaham (7-10), and balam balavatAam cAham (7-11). He of a nature that is well-known to all.Om prakASAtmane namah. dhRtarAshtra was blind not only externally but also in hismind. Even to him, bhagavAn made Himself known. In mahAbhArata -udyoga parva, dhRtarAshtra says - "tvameva puNdarIkAksha! Sarvasya jagatah prabhuh | tasmAt te yAdava-SreshTha! PrasAdam kartumarhasi || "Oh Lotus-eyed One! You are the Protector of all the worlds.Therefore, the foremost among the yAdavas! You should take pity on me. "Another interpretation is that He has a form whose nature is ofradiance. The writer in dharma cakram points out that the prakASa or lightfrom the sun and stars can reveal external objects, but none of thesecan reveal the Absolute Truth. This can be revealed only by mahAvishNuthe prakASAtmA, who gives the external light to the sun and stars in thefirst instance. He who scorches (His enemies).Om pratApanAya namah. SrI BhaTTar interprets this nAma in the context of the gItAwhere arjuna says that he is unable to stand the sight of themagnificent viSvarUpa darSanam when Lord KRshNa reveals that theenemies in the kaurava side are falling into the fiery mouth of the Lordand being scorched to their end - tejobhirApUrya jagat samastambhAsastavogrAh pratapanti vishNo (gItA 11.30). SrI rAdhAkRshNa SAstripoints out that this can also refer to the time of pralaya when the Lordscorches the Earth with the prlayAgni. SrI Sankara gives the explanation that He is pratApana becauseHe heats the world through power manifestations like the Sun. He who is full in all respects.Om RddhAya namah.The root from which this word is derived is Rdh vRddhau - to prosper,to increase. He is full of guNa-s like dharma, knowledge, dispassion,etc. He of clear words (through the veda-s).Om spashTAksharAya namah.The reference here is to the veda-s. SrI BhaTTar's interpretation isthat He is spaTAksharah because He revealed Himself through the lettersof the veda-s very clearly. SrI Sankara's interpretation is that He hasthis nAma because He is clearly indicated by the supreme sound OM. SrIcinmayAnanda gives the reference to gItA in support of thisinterpretation - OmityekAksharam brahma vyAharan mAm anusmaran | Yah prayAti tyajan deham sa yAti paramAm gatim|| "One who chants my name Om and leaves his body at the time ofdeath thus remembering Me, he shall go to the Supreme state".SrI satyaevo vAsishTha gives a very different interpretation. He usesthe root spaS bandhane - to tie together, and akshara to mean thingsthat don't disappear but reappear again and again until (and evenafter?) pralaya - he uses the words Apralaya sthAyI nakshatrAdi inHindi), viz. the nakshatra manDala etc. Thus he interprets this nAma'smeaning as referring to mahA vishNu who has thus tied together and isholding together this Universe with its constellation of the heavenlybodies. The mystic word (He who protects those who meditate onHis name).Om mantrAya namah.tan-mantAram trAyate iti mantArah, or mananAt trAyate iti mantrah -mantra is that which protects him who meditates on it. In BrahmapurANa, BhagavAn says - thRshNA toya samAkIrNAt ghorAt samsAra sAgarAt | apArAt pAramApnoti yo mAm smarati nityaSah || "He who thinks of me always, will certainly cross this vast andfrightful sea of samsAra which is filled with the waters of greed andavarice".SrI BhaTTar also gives the reference to the varAha carama Sloka-s fromvarAha purANa - sthithe manasi susvsthe SarIre sati yo narah | dhAtu-sAmye sthithe smartA viSva-rUpam ca mAma ajam || tatastam mriyamANam tu kAshTha pAshANa sannibham | aham smarAmi mad-bhaktam nayAmi paramAm gatim || "The man who, when his mind is in normal condition, when thebody is not shattered, and when the elementary constituents of his body(dhAtu-s) are in perfect equipoise, meditates on Me who has thew worldas My body and who am not subject o biths due to karmA - when that manlies like a log of wood or a piece of stone in his dying moments, Ithink of this devotee of Mine and lead to attain the Supreme Abode".SrI Sankara gives the interpretation that He is the Sacred formula inthe form of the three veda-s.The writer in dharma cakram gives the perspective on the importance ofmantra-s in our scheme of life. Just as we take external bath forkeeping our bodies clean, mantra-s are the means to keep our mindsclean. This can be done either through constant repetition of themantra-s (japam), through deep and constant contemplation (meditation),through musical singing (bhajan) etc. 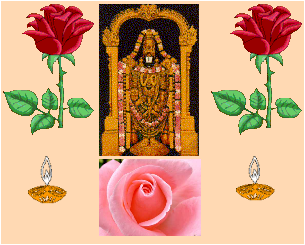 Recall tirumangai AzhvAr - nalamtarum Sollai nAn kaNDu koNDEn nArAyaNA ennum nAmam - peria tirumozhi1-1-9). He who is possessed of the effulgent rays likethose of the moon.Om canDrAmSave namah.The word canDra is derived from the root cadi AhlAde dIptau ca - todelight, to shine. He brings delight to the minds of those who arescorched by the heat of samsAra. He also nurtures the vegetable kingdomwith nutrition - paushNAmi caushadIh sarvA somo bhUtvA rasAtmakah - gItA15-13. It is known in experience also that the cool rays of the moonare soothing. BhavAn is like the rays of the moon for His devotees.